Last week my family spent six days camping. Three days we were with family friends at St Croix State Park and the next three days at Gooseberry Falls State Park, with families from our church. On the first night of camping, we sat around the campfire and read questions from conversation cards. My son got the question, "When have you taken a leap of faith?" He thought for a bit and told of going out for the Jr High Swim team, when he was not a strong swimmer. Now, several years later, he's on the High School Swim team and doing well. He expressed how glad he was he'd taken the leap. 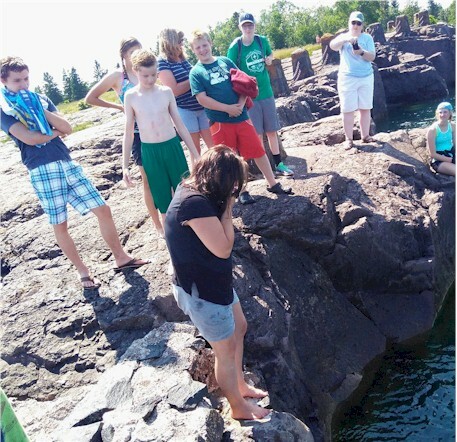 Two days later, I stood on a small cliff at the edge of Lake Superior contemplating jumping into the fridged water. The water was calm and crystal clear yet, I could not see the bottom. I could see large boulders below but, they were at least fifteen to twenty feet down. From all appearances, there should be no reason jumping into the water would be harmful. I watched my pastor jump, and then two teens. They were fine. The water was cold but, they climbed out and did it again. I've struggled with fear all my life. I typically take the safe route and make responsible decisions. The older I get, the more I push myself out of my comfort zone to try new things, even if I'm afraid. I learned to drive a motorcycle two summers ago and love it. I walked a rope course three stories high and conquered it. But, as I looked at the Great Lake that seemed to appear as big as the ocean, I was froze with fear. I heard a couple comments of those around me, curious why I wasn't stepping out. I don't know why this froze me. I can sing or speak in front of hundreds/thousands of people and it doesn't phase me but, this, this scared me. Finally, I asked one of the teens if she'd count off and jump with me; she wasn't afraid. She would and did. When she counted to three, we jumped off the rock into the coldest water I've ever experienced. But, I'd done it! I had faced my fear and took the leap. In life, sometimes we get stuck, standing on the edge of a new chapter or season. We want to move forward but, the unknown causes us to stop in our tracks and hesitate. What if it's not right? What if I'm not ready? What if I get hurt or look foolish? These are all real feelings and normal questions to ask. But, to move forward, we have to step out and take a chance, and sometimes, we belly-flop. It felt good to jump into Lake Superior, not because the water felt good but because I'd not let fear stop me. Let me encourage you today to not allow fear or doubt hold you back but, press on and move forward. Take that leap of faith.